The summer of 1989 was a strange one for me. First of all, congratulations to the Cubs and all their fans. It was a remarkable achievement. Secondly, I went to bed while the score was still 6-3. Had the Mets been playing, I probably would have stayed up for the whole game. This was very much a Mets kind of game, what with the rain delay and the extra inning. Theo Epstein must be very happy. Speaking of which, he's from Brookline, where I live now. I think Brookline has a right to be just as happy as Chicago. And I kind of hope he goes to the Mets now. Finally, I'm glad I never wrote any science-fiction stories contingent on the Cubs never winning the World Series. Twenty-six years ago today, my father died. It feels odd acknowledging this anniversary today, because time has worn away at the emotional pain and shock I experienced the night my father died. On the tenth anniversary of Dad's passing, my family took out an In Memoriam ad in the New York Times, which Mom appreciated. Today, Mom is also gone, and in a way posting here is much more of an acknowledgement of this momentous anniversary than taking out an ad in a newspaper. I tend to think Dad was a fascinating person. He was born in December 1929, in the wake of the stock market collapse, and so grew up during the Depression, which affected his outlook for the rest of his life. When he was almost ten years old, he attended the 1939 New York City World's Fair, and fell in love with the visions of the future it presented. He graduated as valedictorian of DeWitt Clinton High School (which was in Manhattan at the time, I think) and started college at Columbia, where he was editor of the college newspaper, The Spectator. But while he was in his teenage years and World War II was raging, news of the Holocaust came to the United States. My grandfather was a rabbi, and my Dad grew up in a religious household; but the Holocaust caused him to lose his faith in God and to break away from religion. On the other hand, he felt a strong connection to the Jewish people. In the 1940s he ran guns to the nascent Jewish state of Israel, and then he dropped out of college, never finishing, in order to smuggle himself into Israel and fight in the 1948 War for Independence. Dad was dedicated to journalism and newspapers. He used to like to quote Thomas Jefferson, who once said that he would rather have newspapers without government than government without newspapers. Dad spent his life working at a whole variety of newspapers in New York City. In the midst of all this, he married his first wife, Evelyn, and had two sons, my half-brothers David and Daniel. Eventually, Dad and Evelyn divorced. He met my mother Eleanor, married her, and had three more sons: Jonathan, Michael, and Joshua. By the time I knew him, Dad had been working at the New York Daily News for many years. In 1990, the Daily News unions were locked out and so once again went on strike against the owner of the paper, the Chicago Tribune Company. Dad was in the Newspaper Guild union office twenty years ago when he collapsed of a heart attack and was pronounced dead at St. Claire's Hospital. My brothers and I were in the Boston area at the time -- Jon in medical school, Josh and me in college. Jon and Josh were on a train home already because my father's mother had just died the day before, and they were going to NYC to be with my Dad for her funeral. We had no way of knowing that on Sunday, November 4, we would attend one funeral after another, with print and TV reporters gathered with our friends and family, the media there to report on my father's death as another tragic story. My father was a strong believer in justice, in supporting the powerless against the powerful. Two months before he died, I marched with him in the NYC Labor Day Parade. The Greyhound bus drivers were on strike, and Dad – who always kept an eye on family finances – donated money to their fund without blinking. After he died, I found among his personal papers articles he had clipped about a Mohawk tribe in upstate New York struggling to get a piece of land back from the federal government. Dad always shared stories like that with us, to remind us that the fight for justice was a neverending battle. Dad had been a reader of science fiction and comic books when he was growing up; by the time I knew him, he mostly read mysteries. But he inculcated in me a love of science fiction, and my one regret about my own writing is that he never got to read it. But his spirit infuses every word I write. However, there's another way I've been looking at it, which is that I actually spent much of last year (on the Hebrew calendar) getting ready for Yom Kippur. Yom Kippur is the Day of Atonement, and part of the tradition is to seek forgiveness to those you have wronged (and to grant forgiveness to those who have wronged you). In general, we should all strive to be better people each and every day, but the Days of Awe leading up to Yom Kippur is specifically called out as a good time to do this. Many people during this time post general statements asking for forgiveness from those they have wronged. I took this concept a step further last year, and oddly, it was spurred on because of my Harvard 25th reunion. As reunion was approaching last spring, I started to think about some of the wrongs I myself had committed upon friends and acquaintances, especially those in my class. I actually made a mental list and sought out those people at reunion to apologize for things I had done years ago. I didn't limit my apologies to those classmates, though. I had one high school classmate as well whom I felt I had wrong, so I wrote a letter of apology and mailed it out. But in general, I made my apologies in person to my college classmates. I discovered to my fascination that although my wrongs had weighed heavily on my mind for these past twenty-five years, almost every classmate found them irrelevant. One classmate remembered the event I wanted to apologize for but she dismissed it. Another classmate didn't even remember what I had done to him, but understood why I apologized and gave his forgiveness anyway. Essentially, I rediscovered the old adage that sometimes the person who commits the wrong is hurt by it more than the person who was wronged. My classmates literally had forgotten or stopped caring about wrongs I had done to them, and I was carrying the burden of guilt for over two decades. As it is, there are still apologies I want to make and for all I know, there are people out there to whom I need to apologize but will never realize it. All I can really do this Yom Kippur is my best. But because of my experiences this past year, I think I will be able to once again find some meaning in this holiday. For those of you who are also observing, have an easy fast and may it be meaningful for you. How can it possibly be fifteen years ago for something that to many of feels like it happened yesterday? Exactly fifteen years ago today, terrorists attacked the United States of America. They flew planes into the World Trade Center in New York City and into the Pentagon near Washington, DC. They most likely would also have flown a plane into the Capitol building but were stopped by the passengers of United 93. Almost 3,000 people died that day. I'm a New York City native, born and raised in Queens, and I grew up in a city in which the Towers always stood. On 9/11, I was a teacher at a private school in Newton, Massachusetts. The following comes from my journal, a hand-written one that I was keeping at the time. "The second [staff] meeting ended early, and I went back to the Science lab to check my e-mail. I idly noted a message...which said that an airplane had hit the World Trade Center. "I ran to the phone...to call [my younger brother Joshua] at work. At 9:35 AM I called and got him. He had just gotten in, and he said that he seen the smoke from the 7 train. I told him to stay in touch, but due to circuits being busy, I wasn't able to reach New York City again for a while. "When the meeting with the students ended, I collapsed in tears..."
There's more, of course, but to summarize, I spent the day trying to get news of family and friends, making sure they were all safe. They were. I was scheduled to help teach a kindergarten class that afternoon. They were doing a unit on bears and I had a very large Folkmanis brown bear puppet with me that day. The school had deliberately kept the kindergarten students unaware of the day's events, so when I walked into that classroom, they were all smiles and laughter as they played with the bear puppet I was holding. The drive home was surreal, knowing that fighter planes and battleships were protecting New York City. Nomi was already home, as her office had sent everyone home early. The rest of my family was safe, but my older brother, an emergency medicine physician, had been called up to report to New York City. Nomi and I took a walk at 5:30 PM, which included browsing at Brookline Booksmith and getting ice cream at JP Licks. Everything on TV was the news; we watched C-SPAN, which was running a feed from the CBC, so we could get the Canadian perspective. The next few days, the events were fresh in everyone's mind. On Wednesday, I flinched at hearing an airplane in the sky, then remembered that all commercial flights had been grounded, so it had to be one of our military aircraft, protecting us. I bought my regular comic books that day; Adventures of Superman #596 had an eerie panel of the twin towers of Metropolis being repaired. A friend came over that evening after attending a local religious service. On Thursday, Nomi and I were sick of the news, and Animal Planet had gone back to regular programming. We watched a documentary about moose to help us get our minds off things. And life went on. Today, I'm no longer teaching, but editing science curricular materials in Boston; my younger brother no longer lives in New York City, but in Eugene, Oregon with his wife and three children; and my older brother is still an emergency medicine physician in the Boston area, specializing in disaster management. And as all my friends know, there have been other changes in my life. In 2007 I lost my mom. In 2008 I published a book collection of many of my short stories. And in 2009, Nomi and I welcomed two precious and adorable girls into our lives. Being a parent changes your perspective on a lot of things, and 9/11 is no exception. When the attacks happened, I was worried for my mom and my brothers; if something were to happen today, my first priority would be to make sure that my children were safe. I probably don't need to tell anyone this, but today's a very good day to remind your loved ones, families, and friends how much they mean to you. Fifty years ago today, the TV show Star Trek was first broadcast in the United States. Many other people will say much more relevant things than I can about the show. And anyone who knows me is aware of how much this one TV show influenced me. So instead of discussing its influence, I want to share my earliest memory of knowing about Star Trek. "Beep beep! Honk honk! Star Trek!" We laughed. What had happened was that Mom knew that my older brother, Jonathan, liked to watch Star Trek, and she had just remembered that it was about to be shown. (This was when it was in syndication on WPIX, channel 11, in New York City.) So just as she finished the sentence "Beep beep! Honk honk!" from the book, she called out to Jonathan, "Star Trek!" We joked about this for years. But it all began because my parents knew to encourage our interests. Live long and prosper, Star Trek. I can't wait to see what comes next. Thirteen years ago today was the Great Blackout of 2003, which hit much of the northeast United States and parts of Canada. Last week, DC Comics published Superman #2. (I think this may be the fourth time they've published a Superman #2, but that's irrelevant for what I want to discuss.) In the current storyline, Superman and Lois Lane are married and have been in hiding in a new version of the universe for many years. The Superman intrinsic to that universe just died, so the Superman we've known about since the mid-1980s has decided to reveal himself to the world. One issue he and Lois are dealing with, though, is that they have a son, Jonathan, who is starting to develop his powers. He wants to help his dad, but he's unsure of himself, and his parents want to keep him safe. "I'm afraid someday soon -- too soon -- you will have to pick it up and embrace the 'S' for yourself. It's not about our powers, or strength, or heat vision. It's about character. It means doing the right thing when no one else will, even when you're scared…even when you think no one is looking." I loved this. 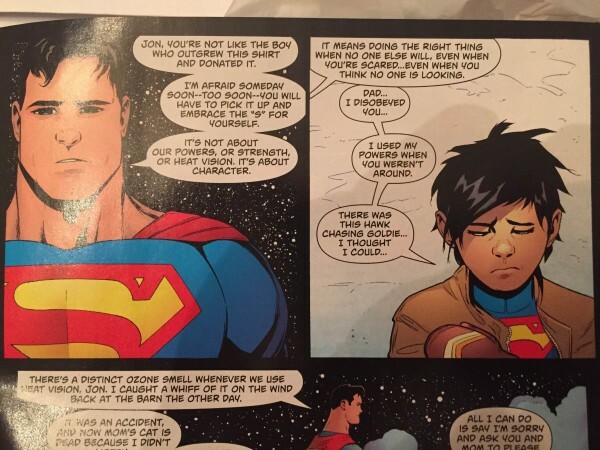 For me, it encapsulates exactly what being Superman is all about, and why I've loved the character since childhood and still buy Superman comics today. I'm delighted to announce that in the July 2016 issue of Apex Magazine, released today, I have an interview with Andrew Fazekas, The Night Sky Guy, about his new book "Star Trek The Official Guide to Our Universe: The True Science Behind the Starship Voyages." If you follow the first link above you can find out the rest of the contents and buy the issue for the incredibly low price of only $2.99. "It is now no more that toleration is spoken of as if it were the indulgence of one class of people that another enjoyed the exercise of their inherent natural rights, for, happily, the Government of the United States, which gives to bigotry no sanction, to persecution no assistance, requires only that they who live under its protection should demean themselves as good citizens in giving it on all occasions their effectual support."